Hi Bonnie. 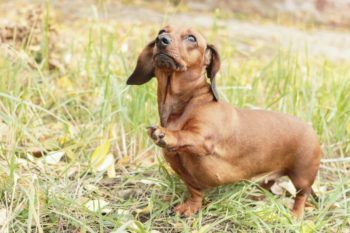 Dachshunds are a breed that is notorious for barking. However, I understand your frustration. I don’t mind if mine bark to alert me of something but I try to discourage them barking a lot just because they feel like it. I also understand it can be a real issue if it annoys neighbors. Bark collars are very controversial but I think they are ok as a last resort IF they are used properly. Ideally, you can find a dog trainer that would be willing to teach you how to properly use one to curb his barking. That can be a challenge though, depending on where you live. A bark collar is considered punishment-based training (vs. positive reinforcement) and most dog trainers only use positive reinforcement nowadays (which MAY work by the way – it certainly doesn’t hurt to try a consult with one to see if they can help). For me, I limit my dog’s time outdoors. They definitely bark less when I am out there to supervise them so I don’t let them out unattended for long periods. I’ve also found that yelling at them to stop doesn’t work. Distracting them by clapping and saying “that’s enough” has worked a lot better, although it is not foolproof. Lastly, you can read this article on my blog about the barking issue: https://youdidwhatwithyourweiner.com/why-wont-my-dachshund-stop-barking/ Maybe it can provide some tips. Good luck.